Protection, abilites and platinum angel. Equipped creature gets +2/+2 and has protection from black and from green. Patryn I just got a Mana Drain today in a pack of Iconic masters as well as picking up the Sword of Feast and Famine from a local shop so the deck is coming along nicely. I was just curious of your thoughts of Mana drain since it only gives colorless mana. Mana Base: In an ideal world you'd have 10 duals, 10 fetches, the good rainbow lands, X shocks (built around your card colors), Gaea's Cradle, and a basic or two. Most people won't have this but you can replicate it with 10 shocks, 5 battle lands, as many fetches as you have, up to 10 check lands, and up to 10 basics (5 regular, 5 snow so they work with Tainted Pact.) Depending on your average CMC I think you can cut one land (I run 34). Ramp: Ideally all of your ramp would be 1 CMC or less so you can use it in your opening hand to get a turn 2 Najeela. 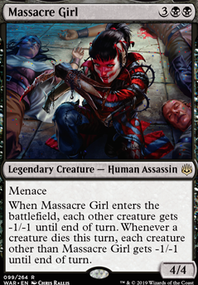 You could add more dorks like Deathrite Shaman , Avacyn's Pilgrim , and Elves of Deep Shadow . 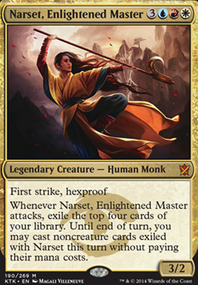 I personally don't like dorks since they die to wraths but most of the best Najeela decks run them. You could also add Wild Growth and Utopia Sprawl (depending on forest count). I'd cut Commander's Sphere, Darksteel Ingot, Pillar of Origins (can't tap to activate Najeel'a ability), Fellwar Stone, Kodama's Reach, Sakura-Tribe Elder, Rattleclaw Mystic, and Farseek. Normally I'd say cut Chromatic Lantern but it helps fix your mana base so depending on how your revised mana base performs you can decide whether or not you still need the lantern. Also Harvest Season is cool but depends on how many basics you end up with and its slow. Combo vs. Pump: You currently run approximately 5 cards that go infinite. When you go infinite it doesn't matter if you're attacking with infinite 1/1s or infinite 6/6s. This is a personal taste call but if you like the combo finish I would cut almost anything that pumps your team and replace it with tutors / counterspells. I'm personally not a fan of Cryptolith Rite because of needing vigilance / a ton of warriors but it helps fix your mana base so up to you. I'd also replace Bear Umbra with Sword of Feast and Famine if you have it. I'd cut Beastmaster Ascension, Anointed Procession, Door of Destinies, Oketra's Monument, and Lovissa Coldeyes. The only pumps I do like are Bramblewood Paragon and Metallic Mimic because they come down turn two which lets you start the pain train turn 3. 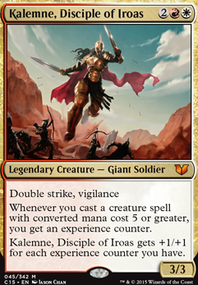 Other: In my opinion you want to keep your CMC as low as possible because if you have 5 mana you could be activating Najeela or keeping up mana for counterspells/protection spells. 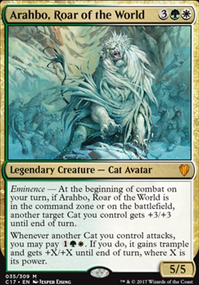 Here are some other random cut suggestions: Brighthearth Banneret, Grand Warlord Radha, Hearald of Dromoka, Mardu Strike Leader, Ogre Battledriver, Thrasher Brute, Behind the Scenes, Bow of Nylea, (replace Bow and Behind the Scenes with Reconnaissance and Dolmen Gate for sure) Lightning Greaves, Swiftfoot Boots, and Driven/Despair. TLDR: Reduce CMC and focus on combo instead of pump. I want to say that I see why you put every card in the deck and I'm sure the deck works fine as is so feel free to take any of my advice or none of it. I play Najeela a lot in a semi-competitive environment and here is my deck if you want more ideas Najeela, the Blade-Blossom. I keep a ton of stuff in the Maybeboard of things I used to run or think might be cool. i would put Sword of Feast and Famine , Sword of War and Peace and Sword of the Animist in the deck, they are alle equipments that is pretty powerfull, don't underestimate Sword of the Animist in a non-green deck. I really miss the Life and Limb + Sporemound combo, but something had to give for all the additional ramp. Please let me know if y'all feel like I've made any improvement. how do you feel about Druids' Repository ? Most time I play it it ends up paying for itself anyway and can seriously smooth out sequencing issues/ accelerate to extra turn spells. 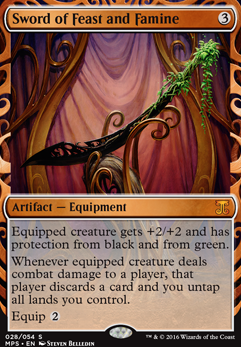 I also Like things like Nature's Will etc for the same reason (also it gives you a little protection as does Sword of Feast and Famine . Timestream Navigator is a repeatable extra turn spell that is tutorable and the restriction is very minimal in Edric. I also like Words of Wind even though its a bit janky, but it attacks all opponents and it's easy to break parity with lots of 1 mana creatures.